(Nanowerk Spotlight) The list of great monuments and frescoes destroyed or seriously damaged by negligence or criminal action is dramatically increasing, and the biggest culprit is air pollution. Pollutants such as sulfur dioxide and nitrogen oxides are the most serious causes of degradation in carbonate stone, which in the form of marble, limestone and similar materials comprises some of the most important monuments and artifacts in the world. The main damage to monuments is that the stonework becomes sulphated through the transformation of calcium carbonate to calcium sulphate owing to the presence of sulphur dioxide. Two forms of deterioration then take place: the constitution of a black film in areas sheltered from the rain, and elsewhere the crumbling of the interior of the stone. For instance, UNESCO estimates that the surface eaten away annually in a cultural heritage site such as Venice represents 6 per cent of marble and stone monuments and 5 per cent of frescoes. The problem is not only what causes the damage but also how repairs are done. Quite often, the experts in charge of restoration work - architects, restorers, renovators - conduct their work without previous scientific studies of the damaged monument. Specifically the consolidation of decayed stone in historical buildings is a common intervention that can cause irreparable damage to the monument. Although commercial products, such as alkoxysilanes that are commonly used to consolidate stone, present unquestionable advantages they also present certain disadvantages totally ignored by the experts in charge of their application. Scientists in Spain are committed to the development of new nanotechnology materials specifically suited to stone-based historical structures. Their objective has been the development of a new nanomaterial which forms a crack-free gel in the pores of the treated stone. Consolidation of decayed stone is one of the most common interventions in the restoration of historical buildings (just to be clear on the difference between a consolidant and a preservative: The aim of a preservative is to totally preserve the stone in whatever state of weathering it has reached and stop all future decay; this generally means applying a coating to the surface of the stone which totally protects it from the effects of the atmosphere around it. Consolidation aims to stabilize the friable material whilst still allowing weathering to take place as a result of natural processes and at a natural rate). Commercial consolidants are based on a silicon monomer – usually tetraethoxysilane (TEOS) – and an organic solvent. The product is applied in liquid form and polymerization takes place in the pores of the deteriorated stone by way of a classic sol-gel process, forming a silica network which is able to stabilize the decaying stone. Advantages of these consolidation products are well known to professional restorers: 1) they are low viscosity products, which facilitates a deep and homogeneous penetration into the decayed substrate; 2) Humidity present in the rocks is enough to produce the spontaneous gelification of the product; and 3) The polymer forms oxygen-silicon bonds with a similar nature when comparing them to the existing bonds in the minerals of the rocks. "Although the advantages of these materials are without doubt, their application also comes with a number of disadvantages" Dr. María Jesús Mosquera Díaz explains to Nanowerk: " 1) Poor adherence to certain stones of calcareous nature; 2) Poor cohesion and increase of mechanical resistance after consolidation; and 3) Formation of a fragile gel with numerous fractures. This last aspect is, of course, the most worrying one and the one that has caused numerous instances of damages instead of benefits to the consolidated building." Mosquera is a professor in the Departamento de Química Física at the University of Cádiz in Spain. The obvious question that she and her colleagues asked was: Why does the consolidant break? 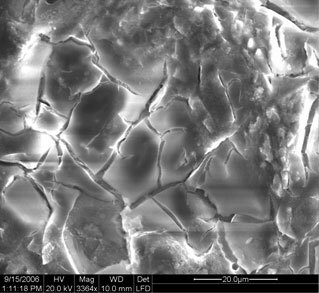 "Any person familiar with sol-gel processes knows that one of the main problems is the great difficulty that this technique presents in obtaining monolithic materials or fracture-free films" says Mosquera. "The evaporation of the solvent trapped in the gel network causes the formation of a concave meniscus in the interphase between the liquid and the vapor which causes the development of a pressure gradient in this interphase. This pressure is released by the spontaneous shrinkage of the gel. The shrinkage finishes when the gel network reaches a rigidity superior to the strength imposed by the capillary pressure, giving rise to the movement of the liquid/vapor interphase into the pores." What this means is that, during the drying process, the gel supports the capillary pressure inside the stone's pores. If this pressure is high, the gel network fractures. Therefore, as the consolidation product gels into the pores of the rock, the gel supports a capillary pressure which is inversely proportional to the pore radius. This is the reason why the commercial consolidants on the market today generate dense and microporous gels which enhance elevated capillary pressures during the drying phase, which ultimately leads to cracks in the gel. In the past few years, several attempts to synthesize crack-free consolidants have been made. The key obviously lies in reducing the capillary pressure during the drying process. One way to do this is by increasing the pore size of the gel network. Researchers developed hybrid gels consisting of TEOS (the same polymeric precursor of the commercial products currently used) and colloidal silicon particles. The obtained gels had increased pore size (28 nm), resulting in a significant reduction of the value of capillary pressure and subsequently, more crack-free consolidants. 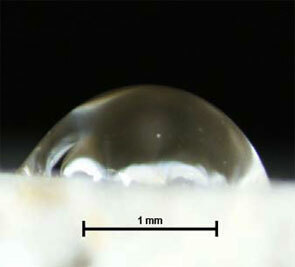 The only negative aspect of the new material is its whitish color due to the inclusion of colloidal particles. This can be a problem in treating dark colored stone as the whitish film would be clearly visible on the surface. This problem could be solved by introducing colloidal particles of titanium and iron oxides into the TEOS matrix to obtain the desired color that matches darker stones. Unfortunately, this would require the synthesis of a specific consolidant for each type of stone by using oxide precursors with chromatic characteristics similar to the stone color. This approach doesn't appear to be feasible with regard to an industrial production of consolidants. The work by the Spanish scientists presents an innovative solution: they synthesized a nanomaterial by using a surfactant as template. In this novel consolidant synthesis process the sol-gel transition occurs in the presence of the surfactant (which increases the pore size of the gel). This provides an efficient means of avoiding cracking of the gel while it is drying inside the stone. "In order to obtain mesoporous gels, we use a tensoactive agent as a template for the porous structure" explains Mosquera. "This technique, discovered in the 90?s by Mobile Corporation researchers, allows the synthesis of nanomaterials known as molecular sieves. Unfortunately, this technique cannot be used in the case of consolidation products because the product must be applied as a sol and must polymerize into the pores of the decayed stone of the building. Therefore, the main objective of our work was the development of a totally innovative procedure based on the synthesis of molecular sieves." Taking into account the particular characteristics of consolidation processes, Mosquera and her collaborators describe their novel synthesis technique in the February 1, 2008 online edition of Langmuir ("New Nanomaterials for Consolidating Stone"). Recently, Spanish researchers have designed a novel sol-gel synthesis in which a nanomaterial with application as water repellent and consolidant is obtained. 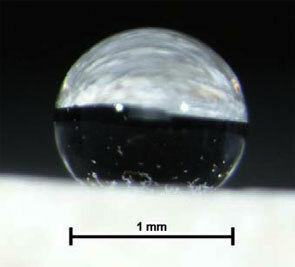 The organosiloxane, integrated in the silica network, makes the gel hydrophobic.